From 60 to 150 Tn. Used for mining and other heavy duty vehicle maintenance applications. Models with one stage and telescopic with two and three stages. Operated by an air/hydraulic pump. Air pressure required: 8 to12 bar. Air inlet port: 1/2″ BSP. Dual descent valve for greater control. 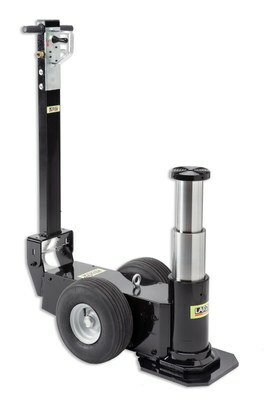 Fitted with self sealing pneumatic tyres for easy maneuverability.